All you you have to do is get signed up and place a £25 bet on anything you like at evens or above and you get a free £25 bet. Naturally this being bet72 it is all nice and easy to collect some risk free profit one, as we have all the bets for these boys on Oddsmatcher so what are you waiting for. This offer is for first-time customers registering an account at totesport.com, on totepool mobile or via the Call Centre between 00:00 1st June 2014 and 23:59 30th June 2014. In order to qualify for this offer you must place a qualifying bet before 23:59 30th June 2014. Place a qualifying bet on an event of your choice and we’ll credit your account with a free matched bet, up to €/£25. Both the qualifying bet and the free bet can be a win, each-way or multiple bet providing that the odds (or combined odds if a multiple) are Evens (2.00) or greater. The free matched bet can be claimed on any ONE of the following channels only: internet, mobile/app, telephone. Your qualifying bet must be placed on the same channel you registered on. E.g. if you registered on mobile, your first bet must be on mobile to trigger the free matched bet. Free bet credit must be used entirely in one transaction. Your free bet will be credited to your account immediately after your qualifying bet has been placed. Your free bet will expire 7 days after your qualifying bet was placed. To use the free bet credit online you must select the free bet option from the drop down menu on your bet slip. Free bet cannot be placed on the same selection in the same market as qualifying paid bet. Free bet can be placed on the same market on a different selection provided there are 5 or more runners OR 3 or more possible outcomes. Free bet stake not included in returns. This offer does not apply to totepool bets (such as the totescoop6), numbers bets or bets that are void. Customers from the following countries do not qualify for the free bet: Poland, Romania, Portugal. Offer cannot be combined with any other bonuses offered by totepool.com. Offer is limited to one per person, family, address, email address, telephone number, payment account number (e.g. debit or credit card), and shared computer. We reserve the right to withdraw the offer from any customer or group of customers. Totesport reserve the right to amend, change or withdraw this offer at any time during the promotion period. Customers must be 18 years or over. Totesport rules apply. Hot on the heels of our recent slots success at William Hill (see here) it’s straight into the one and happy to say with more profitable results. This time at Mecca Bingo and a free £10 for all, look…. The characters of Little Britain have grouped together to create a unique slots game packed with patriotism and all things British! Andy, Anne, Daffyd, Emily, Lou, Marjorie and Vicky each have their own special bonus features that give you the chance to win massive jackpots every time you play. To help you explore this beautiful and barmy slots game, if you stake £20 between Monday 27th October and Sunday 2nd November, we’ll give you £10 free! All you have to do is enter the code “BRITAIN” before you play and, when you’ve spent £20, we’ll credit your account with £10 free! 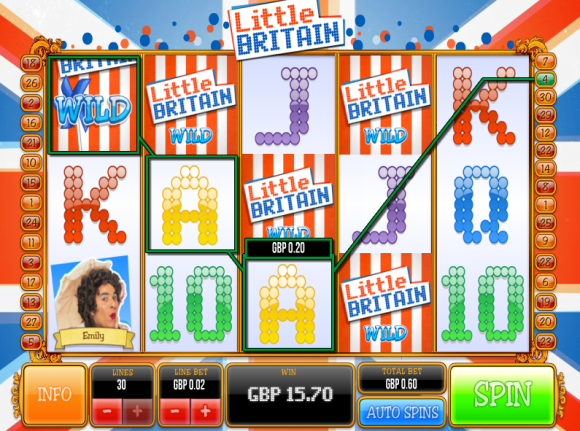 Make your computer say yes to big wins with our Little Britain slots! £20 in. £37.50 out in less than 5 mins. Lovely! Well worth having an account here as they have regular offers just like the one above and they have given us a decent return throughout the whole year. So if you have a account already then you can dive straight in. If not then just click below and you can also pick up a couple of tasty extra bonuses too. A free £40 to play bingo with on your first deposit and then an extra £10 slots bonus too for your second deposit. • Choose bingo rooms which have a relatively low number of players. When I signed up originally I made £15 overall profit playing the one of the Bingo games at a time when there were only 25 other players so naturally my chances were greatly increased. Obviously evenings and weekends are busier times so you can only do this when it is practical to do so. • Maximise your winning chance by buying as many bingo tickets for a specific bingo game as you can. This way your tickets will represent a greater proportion of the tickets in play and you stand a much better chance of winning. However never spend more than 75% of the value of the overall game prize in tickets, so if the Jackpot is £20, never spend more than £15 tickets in a single game. Grab your phone again as there is some more free money to be made. 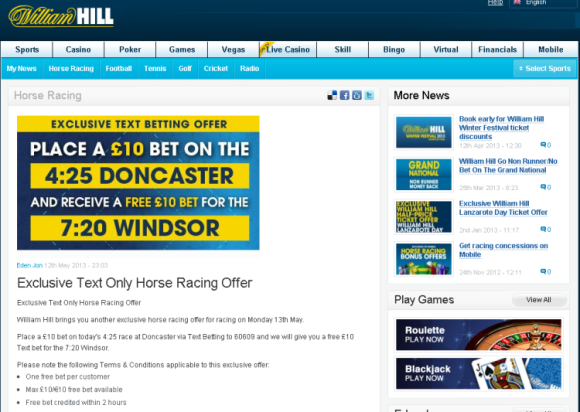 Yes William Hill have free tenners for everyone, look…. Place a £10 bet on today’s 1:45 York via Text Betting to 60609 and we will give you a free £10 Text bet for the 3:15 York. Free bets will be credited within an hour of settlement of the 1:45 York. So if you have an account already then get texting. If not, then you can bag a free £25 sign up bet too. Of course we have it all covered in Oddsmatcher so finding a match to lock in more risk free profits could not be easier. Grab your phone as there is free money to be made. 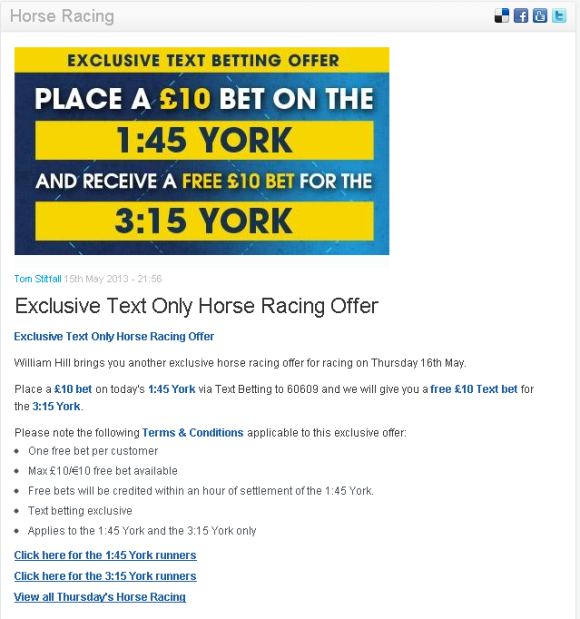 William Hill brings you another exclusive horse racing offer for racing on Monday 13th May. Place a £10 bet on today’s 4:25 race at Doncaster via Text Betting to 60609 and we will give you a free £10 Text bet for the 7:20 Windsor. Qualifying bets must be placed after 10:00am Saturday 1st December. No bets placed after the off/in running count. Of course the perfect companion to maximise this offer is access to Oddsmatcher Pro. Real time live odds including all the horse racing. Just doing this one offer for risk free profit will almost cover a months access to the software. Now that is a no brainer! 1. Offer is available to new and existing online, phone and mobile customers. 3. In order to receive the Free Bet offer, customers must place a win single bet of £/€10 or more on the two selected races. If bets are each-way, the win part must be at least £/€10. 4. Qualifying bets must be placed after 10:00am Saturday 1st December. No bets placed after the off/in running count. 5. Free bet will be £/€10. No pro-rata free bets will be given. 6. Free Bet will credited automatically once the second qualifying bet is placed. 7. Free bet will expire at 23:59:59 on Friday 7th December. 8. You must be aged 18 years or over to bet and participate in this promotion. 9. One free bet per customer. 10. Offer only available to customers in the United Kingdom and Ireland. 11. Void bets do not count towards the offer. In the event of one of the qualifying races being abandoned, the offer will either be amended or withdrawn. 12. Bets placed after an event has started will not qualify. 13. Free Bets are non-refundable. The Free Bet stake is not included in any returns. 14. Free Bets must be used in their entirety as a win single, and can be used on any sport. 15. Free Bets can be redeemed online or on our mobile channel. 16. Free Bets cannot be used to fund tote, pool or lottery bets. 17. Free Bets issued online, by phone or on our mobile channel cannot be redeemed on any other online product (Casino, Poker, Bingo, Games, Lotto). 18. Redeemed Free Bets will not count toward qualification to view streamed events. 19. Free Bets do not count towards qualifying for any other promotional offers. This offer may not be used in conjunction with any other offer. 20. A Free Bet cannot be partially redeemed. If you attempt to place a bet for a lesser total stake than the value of your Free Bet, the remaining value of the free bet will be void. 21. The stake is not returned on winning bets placed with free bet tokens. 22. Ladbrokes accepts no responsibility for system or connection problems that might affect any end user during the promotion. 23. Ladbrokes reserve the right to withdraw this promotion at any time. 24. In the event of a breach of these terms and conditions Ladbrokes reserve the right to take such action as it deems appropriate in its absolute discretion. 25. The promoter is Ladbrokes Sportsbook LP, a limited partnership registered in Gibraltar, number 44, whose registered office is 57/63 Line Wall Road, Gibraltar. Place a £10 Fixed Odds treble, selecting from races at Newbury on Thursday 29th November. Only trebles count, permutation bets will not count. Only bets placed through our Multiples betslip will count, bets placed using our traditional Multiples product will not count. You will receive a £10 Free Bet. Your Free Bet must be placed on a Fixed Odds treble, selecting from races at the Newbury meeting on Friday 30th November. Again, treble bets only, permutation bets will not count. Find out how to place your Free Bet here. Note: you will not be able to place either your qualifying bet or your Free Bet until Fixed Odds markets are live. Fixed Odds markets for UK and Irish meetings usually go live on site between 10 and 11 on the day of the meeting. Place a £10 Fixed Odds treble, selecting from races at Kempton on Wednesday 21st November. Only trebles count, permutation bets will not count. Only bets placed through our Multiples betslip will count, bets placed using our traditional Multiples product will not count. Text betting is here and it is so easy even Dean Gaffney could do it. 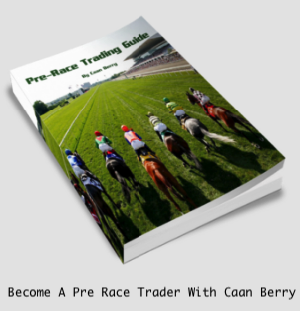 It’s the simplest way to get your bets placed on any market and any event. Simply write your text like you would write a betting slip in shop. Paddy is so excited by all this newfangled whiz-kid technology he’s got a stunning offer for all text bettors. Place up to £10 on your next TEXT BET & get a FREE TEXT BET to the same stake! We’ll text you back confirmation of your bet & if your bet’s a winner, we’ll even text you to congratulate you and tell you the good news. Just make sure on your first text that you include your username otherwise we won’t know who you are. We may be good at a lot of things but our psychic powers aren’t the sharpest. That’s not all you can do by text though and the tech geniuses in Power Tower have lined up a bucket-load of features especially for Paddy Power punters. You can place any bet on any market on any event. You simply write your text like you would a betting slip. To get your balance all you have to do is text the word ‘Balance’ and we’ll text you back. It is an incredibly handy tool to use and what better way to start text betting than with a cheeky free bet? It’s like Christmas come early for Paddy Power punters. Paddy will text back confirming your details and that is it. Just make sure your text from the number registered on your account. To sign up and get cracking just click below…. and if you need one a Betfair account to make all risk free too, here you go…. Continuing the family theme here is another, yes another, offer from the JenningsBet (IOM) family of bookmaker sites. This time we have 777BETS and a free £10 offer for all new sign ups. Once again whilst you may not have heard the name, the site is part of the JenningsBet (IOM) family of sites so shares the same skin of a website as some of our bookmakers at bet72…. So all these sites carry the same odds and markets but they all have their own unique offers, so you can have an account at each one, brilliant! Here is what 777bets has just now…. To open your new account click the “Open New Account” link below and fill in your details. Once your new account has been created, simply deposit funds and place your qualifying bets to receive your free bet. Unfortunately we cannot get 777BETS into Oddsmatcher at this time but with stacks of markets available it should be really easy to pick up some easy qualifying and cashout options. Certainly had no problems when we tested it all out here at bet72. Or just drop us a line to info@bet72.com and we will be happy to send you some options over. So if you fancy picking up another bonus from the Jenningsbet family then just click below…. Offer is available to new 777BETS.co.uk customers only and is open to United Kingdom, Croatia & Philippines residents only. To Qualify, place 1 bet of £10 or more at odds of evens or greater. Once your bet has been settled email support@777bets.co.uk with your username and we will issue you with your free bet voucher. Free bet will only be issued once your qualifying bet has been settled. On receipt of email stating your username we will credit your account with your free bet within 48 hours. Free bet is valid for 30 days after issue, if left unused after this time it will become invalid. Free bet stakes are not included in returns and is non-withdrawable. Free bet cannot be used in conjunction with any other offer. One free bet per customer only. If a customer opens a duplicate 777BETS.co.uk account then we reserve the right to close the account and make any bets placed void. The free bet offer is limited to one per person, household, IP address, ISP network, email address, telephone number, same payment account (e.g debit or credit card, Neteller, Skrill etc) and shared computer, e.g. university, public library, workplace. Non-runners/Voids do not qualify as valid bets. If any bet is a non-runner/void you will not be eligible for a free bet. If your free bet is placed on a non-runner then the bet will be made void and the stakes returned to your free balance. 777BETS.co.uk reserves the right to withhold any free bets if believed that the offer has been abused and/or where the terms of the offer are not fulfilled or any irregular betting patterns are found. 777BETS.co.uk decision is final. 777BETS.co.uk reserves the right to withdraw this offer at any time, for whatever reason and without prior notice. 777BETS.co.uk reserves the right to alter these Terms & Conditions at any time without prior notice. The opening account offer cannot be used in conjunction with any other offer, however if you have placed more than 10 bets at evens or greater your account will be credited with the free bet. – Offer valid only for Unibet Customers residing in the UK. – Offer only applies to customers who have never placed a bet through Mobile. – Both, pre-match and live bets count towards the promotion. – Only your first mobile bet of at least £10 within the promotion period will be counted in this promotion. – The maximum refund is £10 and this bonus amount will be credited the next day from when the bet is settled. And if you don’t have an account yet then you can pick a free £20 sign up bonus too. So grab that then grab your mobile for another free £10 as well, brilliant!